This page gives an outline of how polyplumb tubes and fittings are used within a Polyplumb Underfloor Heating system. The main benefits of the Polyplumb system are : Low Maintenance, Simple Installation, Easy to Control, Flexible Design, Energy Efficient, Secure, Clean and Safe. If you require further help please contact us on 01244 288000. Polyplumb manifolds use Polyplumb fittings for connecting to a circuit. As many of our domestic floor heating systems use 15mm Polyplumb pipe, any of the pipe not required for your project can be re-used for other heating or hot/cold water services using the Polyplumb fittings range. There are six stages to successfully jointing the Polyplumb system. These instructions apply to Polyplumb when used in hot and cold water or heating applications, including under floor central heating. Always use one of the approved pipe cutters (Code PB777 or PB781). A slight rotation of the pipe when cutting will help make the operation easier. Never use a hacksaw. Wherever possible, cut on a depth insertion mark, these “K” shaped marks are equally spaced along the pipe and indicate the depth required for full insertion into a Polyplumb socket fitting. Wherever possible, use a rotational pipe cutter when cutting copper pipe. Ensure that all cut ends have a rounded lead in, with burrs removed. 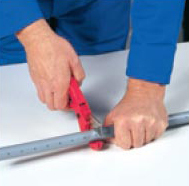 Never use a hacksaw.You will need to mark the depth insertion on the pipe, the insertion depths are shown in the table. 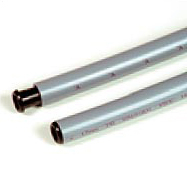 Pipe stiffeners are an integral part of the joint when using Polyplumb pipe with either Polyplumb fittings or compression fittings and need to be fully inserted in to the pipe end.They are not required when usingcopper pipe. Although every single socket is visually checked during the manufacturing process to ensure that all components are present and in the correct order, a further visual check is recommended as tampering by others can take place on site or during distribution. The cap should be hand tight only. Caution - Do not insert fingers into the Polyplumb fittings, as the grab ringis sharp and designed to grip. Note: Components shown in dismantling section. The pipe should be inserted into the fitting to full socket depth such that the insertion depth mark aligns with the outer end of the cap nut on the fitting. A quick tug on the pipe will confirm that the pipe is inserted past the grab ring and that a grab ring was present in the fitting. 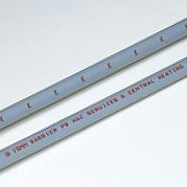 It does not however ensure that the pipe is fully inserted as this can only be confirmed by using the depth insertion mark.